All riders are given their own Quad bike for the duration of the instructor led Quad Trek and we kit you out in overalls to protect your clothing as well as supplying you with a helmet and a balaclava. After a comprehensive safety briefing and instruction session, it’s time to ride! The machines are fully automatic 400 cc Suzuki Quad bikes, making them suitable for all levels of ability. You just get on and ride – it really is as simple as that!! The forward gear is variable speed, so there is no changing gear and the speed is controlled by a thumb throttle. The only other control is the BRAKE!!! Each trek is different as we have over 200 acres of land to play with, which include mature woodlands, swamps, brooks, open fields, mounds and speed arenas. Choose from our standard 10 mile trek or the extended 15 mile trek. The experience roughly last between 2 and 2 and a half hours, depending on which length of trek you do. Our experienced instructors are constantly assessing your ability to ensure that you are safe, achieving your potential and having an awesome time! Check out our Customer comments page to see the testimonials from satisfied customers. The minimum age for quad biking is 10 years old, and for the juniors (10-15 years) we use the Polaris 50cc – 200cc bikes. If you’d like to go out as a Family on one of our Quad Bike trekking sessions then this can be arranged. If the youngest person in the family is 10 to 13 years old then the Quad Biking trek length will be 10 miles. If the youngest person is 14 years old (or over) then as a family you can choose to do either the 10 mile trek or the 15 mile trek. How much is the Quad Biking? Please see our Prices page for the prices of our Quad Biking. How often are the Quad Bike sessions? We have daily sessions running at 9am, 11am, 1pm and 3pm. We also run sessions at 5pm and 7pm in the summer months. We will take out a minimum of 2 riders with a maximum of upto 26. We run a ratio of 2 instructors to 8 people. The maximun weight for a person to be able to go on one of our Quad Bikes is 30 stones. How do I book Quad Biking? You can either call us on 01335 360485 or alternatively you can purchase from our Online Shop where you will also find Gift Vouchers for our Quad Biking as well as Gift Vouchers for our other activities. We try to do things a little bit differently at Wild Park, take a look at the above video, we think this family sum up what we aim to achieve with our quad treks, what do you think? We are an outdoor activity centre, so please dress for the weather. For wet and cold days you will need waterproofs and warm layers of clothing; gloves are recommended. Strong footwear or walking boots are essential. Open toed shoes ie sandals or flip flops are not suitable, nor recommended. After all the fun of getting messy, why not take advantage of our modern changing facilities? We have separate male/female changing rooms with proper hot running showers and toilets. Forget your towel? No problem, hire a towel and some shower gel from us. Got some further queries? Try our FAQs page or give us a call on 01335 360485. 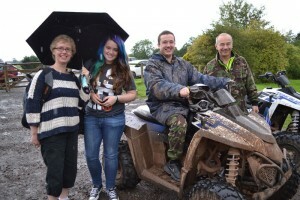 Read through some of the Quad Biking comments from people who have visited Wild Park Derbyshire. Whether you’re in Ashbourne, Birmingham, Derby, Matlock, Newark, Nottingham, the Peak District, Sheffield, Stafford, Uttoxeter or the surrounding areas of the East and West Midlands we are not too far from you and we’re sure that you’ll enjoy your day Quad Biking with us here at Wild Park Derbyshire.